Pettisville’s very own, and favorite agriscience and ag business teacher of 27 years, was honored to receive the 2016 National Association of Agricultural Educators Agriscience Teacher of the Year award in Region IV which includes the states of Michigan, Ohio, Indiana, Kentucky, Illinois, and Missouri. Mr. Poulson was given this award in Las Vegas at the annual convention, along with five other teachers across the nation. On Tuesday, December 13, Mr. Lane called the whole high school down to the cafeteria unexpectedly for a quick announcement. 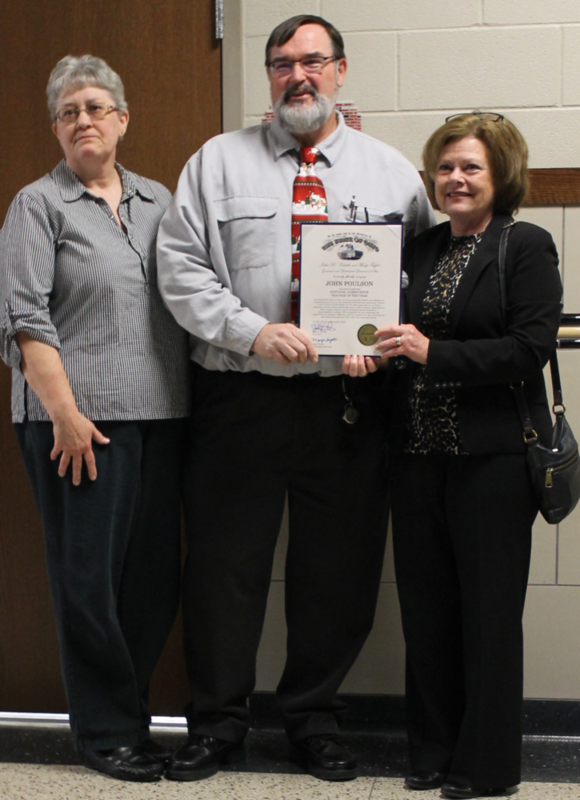 It turns out that LuAnne Cook the Northwest Ohio Regional Liaison for Governor Kasich came to present Mr. Poulson with a proclamation from the Governor and Lieutenant Governor. This award recognizes a teacher who inspired us and enlightened students through engaging and hands-on learning in the field of agriculture. Feeling humbled to be chosen to receive this award from the National Ag Association, Mr. Poulson states, “I don’t believe I’m that different than most other ag teachers, and I am proud of 34 years of teaching service. I appreciate having quality students, peers, and a supportive family. I want to thank those former students, peers, and families that nominated me.” Congratulations to Mr. Poulson on receiving such a high honor!